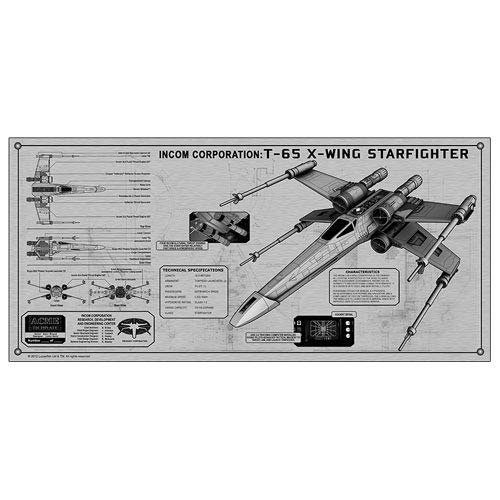 Get all the technical specifications for the X-Wing! Astonishing TechPlate from the Star Wars series. Beautiful collectible measures 21 1/2-inches wide x 10-inches tall. Limited edition of just 295 pieces! Get all of the technical specs to the staple starship of the Rebel Alliance! The Star Wars X-Wing TechPlate from Acme Archives is nothing short of astonishing. Printed on a 1/8-inch thick aluminum metal plate, this amazing TechPlate measures 21 1/2-inches wide x 10-inches tall. Luke Skywalker's starfighter of choice is displayed in all its splendor, with tons of detailed information about the ship, and alternative images for reference. If you're a fan of the Star Wars series, this beautiful collectible belongs inside your home! Limited edition of just 295 pieces, with certificate of authenticity. Designed by a group of Naval architects from Seattle, this TechPlate is modeled after the commemorative christening plates affixed to the bulkheads of ships. Ages 15 and up.